What methods could we use to help prevent a dangerous forklift/forklift, or worse, a forklift/pedestrian collision in a situation like the one presented below? There are multiple options when it comes to these situations. Based on our experience with this situation at a live facility, we've outlined three potential solutions using sensor technology. Forklifts traveling on the north/south aisle cannot see forklifts coming through the wall opening as they move east/west, and vice-versa. Also, on the north/south wall, a pedestrian lane intersects with the east/west forklift aisle. Pedestrians cannot see forklifts moving east/west as their vision is blocked on the west by a wall and frequently to the east by stacked pallet storage. The fact that both sides have a wall between them means that they may have extremely limited reaction times when moving east/west through the wall cut-out. Audible perception may also be affected. 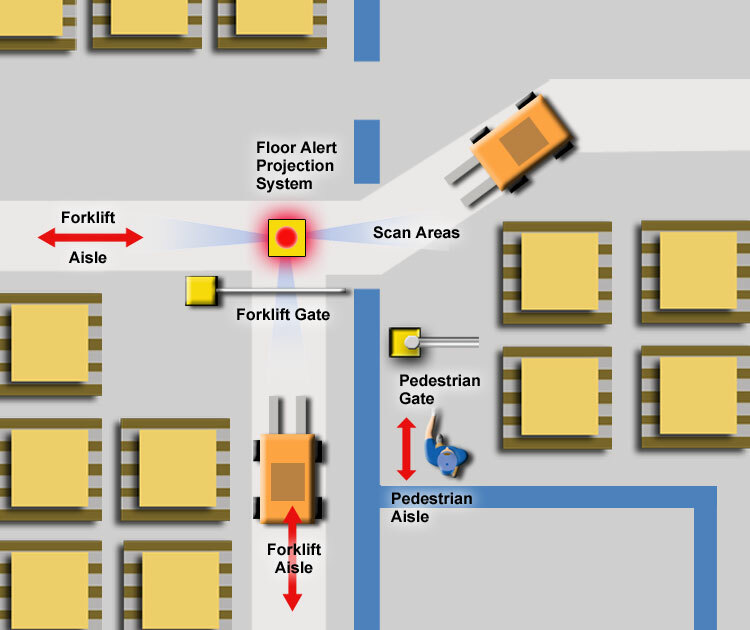 In this configuration, the Floor Alert system scans for traffic in three directions (south, east, and west where forklifts may emerge). When it detects traffic approaching from more than one direction, it projects a bright red, 3' diameter light disc on the floor to help alert drivers in both aisles that another forklift is in the vicinity. The light slowly flashes for increased visibility. The pedestrian aisle wasn't guarded in this application, but a gate system could be added if traffic patterns and safety concerns dictates the need. 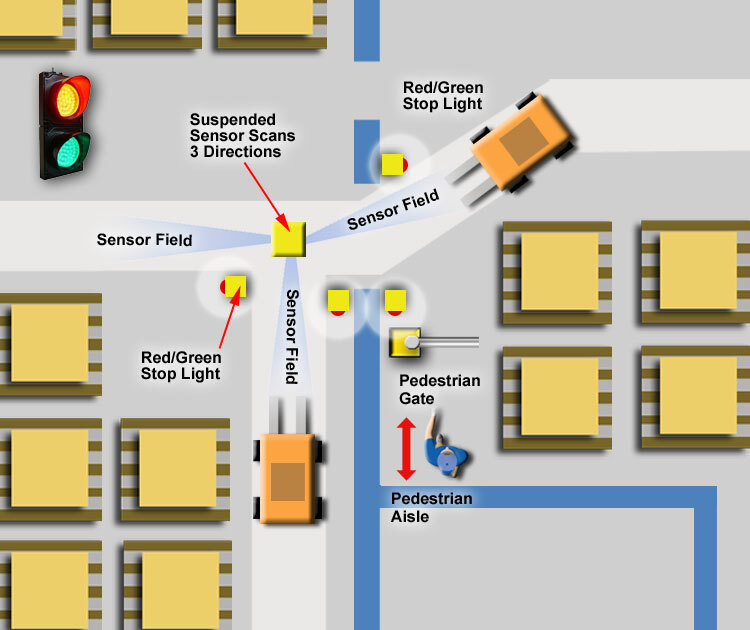 This system utilizes AisleAlert's automated traffic lights to help manage the intersection and reduce the chances of a forklift collision. These lights are controlled by a ceiling-hung, 3-way sensor to detect traffic.The lights facing the main traffic aisle (east/west) are normally green. The lights in the north/south cross aisles are normally red. When the motion sensors detect traffic approaching from the cross aisle, it turns the lights red in the east/west aisle, scans the area to ensure traffic has stopped, and once clear switches the light(s) in the cross aisle to green. At this point the cross aisle traffic can proceed. Once the system determines that the traffic has crossed and left the area, the system re-scans the cross aisle to ensure there is no approaching traffic, switches the lights in the cross aisle from green to red, and then switches the lights in the east/west aisle to green. At this point normal traffic can resume. The north/south pedestrian aisle features a stoplight that helps alert walking personnel to the presence of forklifts in either aisle (including on the other side of the wall). A pedestrian gate could be added to this application to further enhance safety. Also, bright red LED strip lights are an option. They can be added overhead in aisles to further increase visibility. This system also utilizes the Floor Alert floor projection concept, but adds a forklift gate on the north/south aisle as well as a pedestrian safety gate in that north/south lane. Motion detectors scan for traffic in three directions. 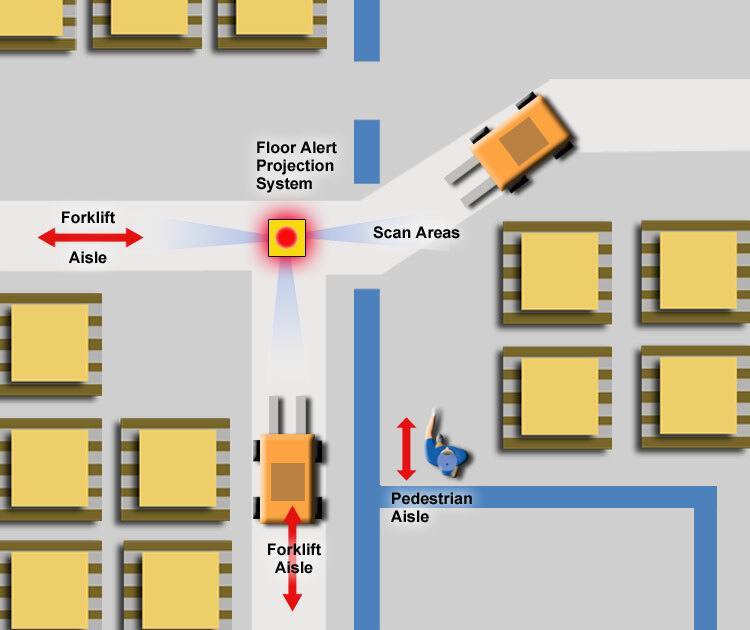 Whenever traffic is detected approaching from more than one direction it triggers the Floor Alert system, which projects a bright red disc of light to help warn forklift drivers that another truck is present in the zone. This system adds another layer of safety with an AisleCop® forklift aisle gate (boom arm) that restricts traffic for the north/south lane when the system detects traffic in the main (east/west) traffic aisle. Forklifts wishing to cross at the crossing gate area activate the gate by one of two pull cord switches. If the AisleAlert system is not active the crossing arm will rise. Once the forklift passes, it will lower the gate by pulling the second pull cord switch. (The vehicle gate will not operate if the AisleAlert system detects traffic. This system also provides an AisleCop® pedestrian safety gate on the other side of the wall at the pedestrian aisle. This gate is also controlled by sensors, and will not open while there is forklift traffic in the monitored zones. If you have a unique traffic management/control situation, our specialists can help you find the method you need to ensure safety and increase functionality without reducing efficiency. Contact us today for assistance.